At the cutting edge of motorsports, a fraction of a second is the difference betwen winning an just taking part. You need the best. 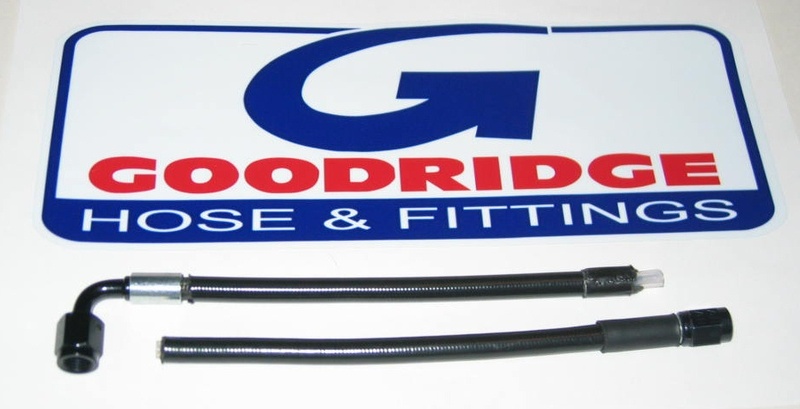 At Goodridge we have combined our 30 years of motorsports experience with a continuous research and development program, to bring you the ultimate PTFE hose. One product that incorporates all the advantages of both convoluted and smooth bore designs. G-Line XF has outstanding resistance to pressure, much higher than that of conventional convoluted PTFE lined hose. In addition to this G-Line XF hose rates are always significatnly higher than convoluted PTFE hose and may allow you to reduce the bore size with the consequient weight and cost savings. All sizes of G-Line XF are usable at full vacuum up to 260 degrees F.
910 is the No. 1 choice of leading motorsports teams, and our flagship lighteweight hose. 910 combines a woven super-light Aramid braid, with a PTFE inner bore-smooth inside for increased flow and convoluted outside for amazing flexibility. 811 hose has all the flexibility and flow rate advantages of 910 hose with a stainless steel braid for additional protection. DragRaceHose.com recommends the above series of hoses for maximum flow. Whenever possible, use correct fitting angles to avoid excessive bends. The 910 and 811 hose are flexible and can bend to most racer's needs. However, in situations that require an extreme bend radius, we do offer a fully convoluted line of the above series. High speed and heavy braking put great strains on competition hydraulic systems, where failure can be disastrous. 600 series hose strongly resists expansion under high pressure and temperature, provides consistent brake and clutch pedal pressure giving firmer and more efficient operation without that spongy feeling. Offering protection against abrasion and fire, these hoses are also recommended for all pressure guage lines and fire extinguisher systems. Available in the following colors: Black, Blue, Carbon, Clear, Clear with print, Green, Red, Yellow, Orange, Electric Blue. 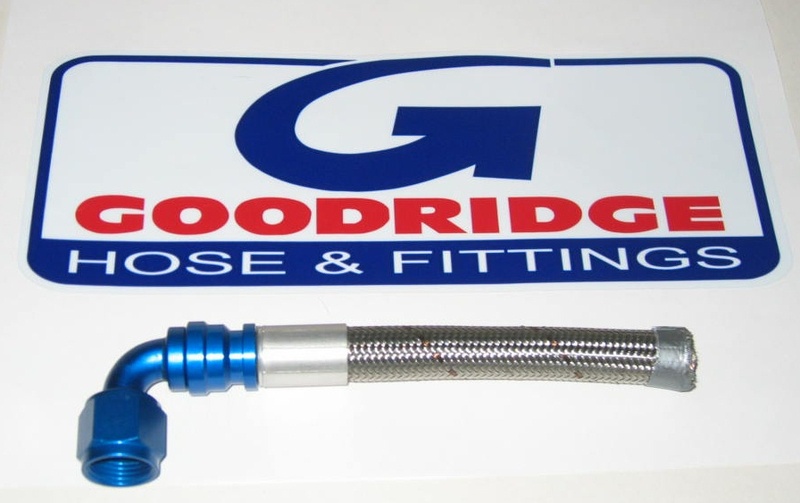 Goodridge 200 Series hose is the premier stainless steel braided nitrile hose. Designed to Goodridge's exacting specifications and exclusively manufactured for Goodridge, this hose has been supplied to motorsports racing champions for many years. 200 Hose is designed for use with a wide range of reusable aluminum hose ends and provides essential protection and resistance to high pressure, temperature, vibration, fire risks and chafing. It is constructed of a seamless synthetic CPE inner with an integral stainless steel braid and a high tensile stainless steel outer braid. Lightweight Black outer braid available! Steel and Aluminum Hardlines available!